It's a no brainer that cheer season is in full swing. With practices and cheer camp, it's only a matter of time before everything really gets going. A new cheer season means new shoes. Toss those old beat up cheer shoes and get the latest and best styles for 2014. But how do you know which styles will make the cut? That's why we're here, duh! We've done all of the work for you and have gathered all the specs on the best cheer shoes for this season. This is a style that is brand new for Asics this year, but don't let that turn you away. The Tumblina may be small and low profile but it is incredibly fierce. It has an amazing rubber outsole for both durability on any surface and for perfect grip for your stunting. Its contoured shape provides the best cushion and support. or fall apart on you half way through the season. What's great about the Zephz Firefly is the incredibly lightweight and easy to clean upper. When you're cheering outside, in the grass or on the track, it takes all of two minutes for your perfectly white cheer shoes to be dingy and gross looking. But this shoe is different, the leather is easy to clean so you won't have to worry about the dirt. It also has an incredibly cushioned sole for comfort. The No Limit Cyclone is probably one of our favorites for this year, it is unlike anything we've seen before and we're in love. The cyclone weighs in at all of 5 ounces! 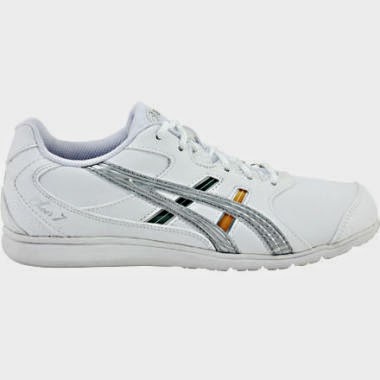 It has the weight and flexibility of your favorite indoor shoes but durable enough to be worn outdoors. No Limit has also added amazing stunting grips and a pivot sole to make sure your cheering is flawless on any surface. Seriously this show will blow you away. Back and better than ever. The Nike Sideline 3 is the perfect update to the old faithful Nike Sideline 2. It's still just as durable and comfortable as before, with the rubberize pivot sole and the comfortable padding around the ankle and heel. However, they have increased the flexibility of it and made it lighter and a whole lot more sleek. But don't worry, they haven't gotten rid of the color inserts. Talk about perfect. 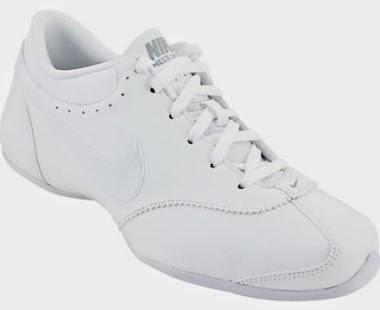 The Nike Cheer Unite is the shoe to replace the discontinued crowd favorite, The Nike Cheer Flash. 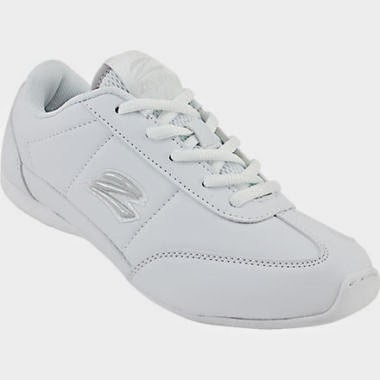 While the look of it is slightly different because they have gotten rid of the patent leather detailing and added a more durable toe bumper, it is built on the same exact comfortable mold that the Cheer Flash was on. Because they have made the detailing a little bit sleeker, it is easier to clean and will keep looking great throughout the entire season. Axeus is a brand new cheerleading brand that is truly amazing. They design perfect cheer footwear that performs throughout even the most intense stunting and tumbling. Don't let the mostly leather upper fool you, it is more flexible than most shoes out there. 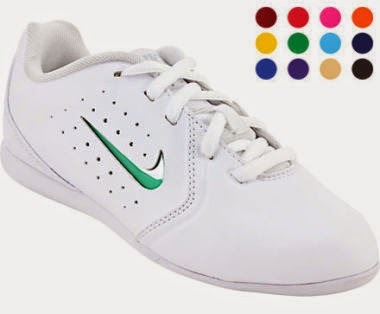 And it has great perforation to help your feet breathe throughout the entire routine. 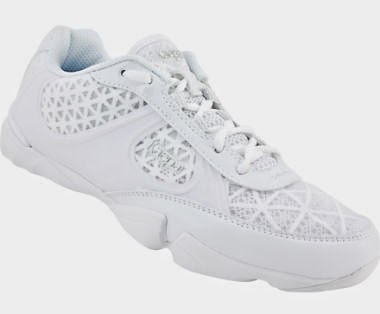 We had some of our staff try them on and it was unanimous...these are so cushioned and lightweight that they are the most comfortable cheer shoes that we have tried on. Trust us--we know our cheerleading shoes. And don't forget Axeus is sold exclusively through cheerandpom.com. 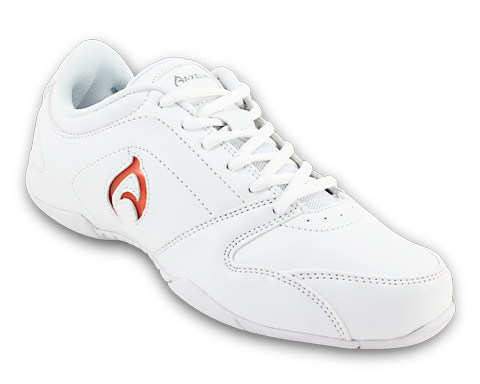 The Axeus Ignite is the perfect partner to the Axeus Flame. The sole on this shoe is incredibly durable but you won't lose the flexibility you want and need. It's advanced design has better construction and features than shoes twice its price. While Axeus has only released two styles this year, one thing is for certain, they are designed for performance without compromising comfort and support. The Kaepa Awesome is just that, awesome. 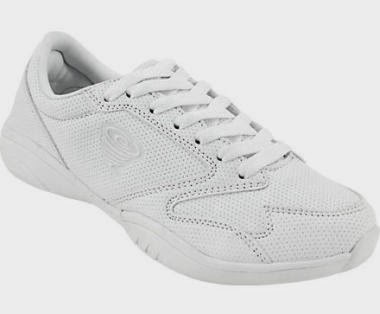 It is so great because it looks and feels like an indoor competitive level shoe, but it includes the durability of an outdoor shoe.Weighing in at 5.9 ounces, it has the secure fit system to make sure your foot is supported throughout any cheerleading skill, K-flex forefoot for flexibility and traction, and finger grooves for perfect stunting. Although it has a fabric upper instead of the usual leather you see on most outdoor shoes, they have scotch guarded the material to help ensure that these stay nice and clean throughout the whole season. So there you have it, the top shoes for the 2014 shoe season. Which ones are your favorite? Let us know which one you choose, we'd love to hear from you! And as always, if you still can't make up your mind, give us a call and we can help you make the decision. 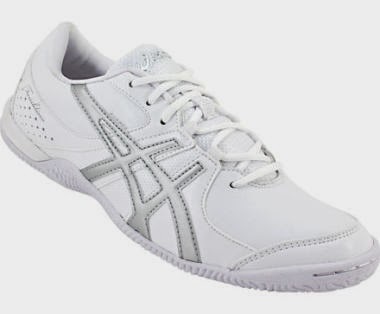 I'm looking for Asic Classic Cheer shoes. I bought mine three years ago. Now I can't find them anywhere. Please let me know where I can purchase a pair! Post a link to my twitter account @keshiscuties. Thanks! Lovely information about shoes. Can I get some information about asics shoes as well. Here I found some good shoes for walking are these good?